Free Nikon camera manuals give you all the information you need to take photos with your new Nikon camera model. However, since there are so many different camera models available, it's important to select the manual that matches your model number. Free Nikon camera manuals can be found in new camera bozes. If you lose the orginal manual, there are ways to replace it. 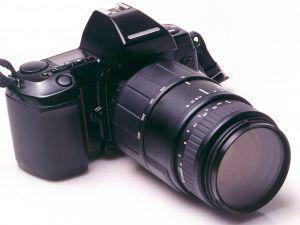 Browse library sales, yard sales, thrift store bookshelves and garage sale tables for used Nikon camera manuals. You may be able to negotiate a free manual if you purchase another item. You can also turn to sites like Craigslist.org or sites that allow users to swap books and manuals. If you swap a book, you can get a Nikon camera manual at no cost. If you have a friend who has a Nikon camera, but never uses it, ask if you can use his manual or make a copy of the manual. The Nikon D line of cameras has models that range from 12.1 megapixels all the way up to 24.5 megapixels. These models typically range in price from $500 to more than $5,000. However, the SLR cameras have additional features that make them ideal for professional photographers and people, who have advanced photography skills, but do not currently have careers in photography. Exposure Modes: Most digital cameras have automatic exposure control, which allows you to control aperture and shutter speed automatically. These automatic controls consider the amount of light available and adjust the features accordingly. Image Stabilization: Some cameras have an image stabilizer, which compensates for this shake. The image stabilizer shoots photos with a slower shutter speed, which reduces blur. The image stabilizer does not affect the blur caused by subjects in motion. Focus: Many Nikon models have autofocus, which removes the need to manually focus your camera on photo subjects. If you want to buy one of the more expensive digital SLR models, find out how many autofocus points each model has before you make a final decision. Zoom Lens: Zoom lenses consist of several lens elements, which allows you to vary the focal length. When you vary the focal length, you have more flexibility in framing your shots. Face Detection: The feature automatically sets the exposure, color balance and focus so that faces are well-exposed in photographs. Some cameras also have smile shutter mode, which triggers the camera to snap a photo whenever the subject is smiling. Playback Mode: With digital cameras, you can use playback mode to review your photos. If you find that a photo did not turn out well, you can snap another one. ISO Settings: The feature allows you to determine how sensitive the sensor is to different light settings. Setting a high ISO allows you to adjust the camera's shutter speed or the aperture.